April 24-27, 2014 – The four-day event you’ve been waiting for! Watch this great video where Steve Schick everything that is going on at Sweet Thunder! Outstanding! Plus Free Installations & Events – Viva Voce, the Sweet Thunder Listening Room, and Compose Yourself Awards Ceremony! Full Festival Pass: $100 ($40 student rate, with I.D.) Enjoy all six concerts, and hang around the Fort Mason grounds to visit Viva Voce, the Sweet Thunder Listening Room, and partake of this recent gorgeous spring weather at one of San Francisco’s most beautiful venues! Click on the image to the right to get your pass! Single Tickets: Click on the concert below to purchase a single ticket. All seats $20 / Student rate: $10.Online ticket sales for concerts close at 5pm the day of (the day before for matinees). Walk-up Tickets are always available for any concert. Seating is open for all events. COMPANION TICKETS available for any ticket purchaser – for $5 you can purchase an additional ticket and share the music you like with a friend. This offer only available for walk-up sales and one companion ticket per ticket holder per concert. “Sweet Thunder Listening Room,” featuring classic works of tape and pre-composed computer music curated by Tom Erbe. Fleet Room – click here for the concert schedule! 6:00 pm – Festival Kick-Off/Reception. For patrons and subscribers, this special concert opens the Festival with Steve Reich’s exquisite Vermont Counterpoint for flute and playback, performed by ICE’s Claire Chase; and a work by Bay Area composer Ed Campion, Corail (2013), for saxophone and interactive software. FMC Festival Pavilion. 7:30 pm – JACK Quartet – SFCMP’s Sweet Thunder Festival opens with a concert by special guests JACK Quartet. Works will include Turgut Ercetin’s String Quartet No. 1; Palimpsest , a new work by Kevin Ernste, the West Coast premiere of Natacha Diels’ Nightmare for JACK, and in a tribute to the late Jonathan Harvey, a performance of his String Quartet No. 4. FMC Festival Pavilion. 7:30 pm – International Contemporary Ensemble – The riotously acclaimed ICE performs a concert of mostly new and significant older works. The latter include two pieces by improv/jazz/experimental icon George Lewis: Shadowgraph, 5 from 1977, and Artificial Life 2007, from 2007; two new works by Rand Steiger, Mourning Fog and Cyclone; Nathan Davis’ 2013 piece, Ghostlight; a World Premiere of In The Light Of Air by composer Anna Thorsvaldsdottir; a 2013 work by Maria Stankova entitled La Bouche. Lewis, Steiger, Stankova, Thorvaldsdottir, and Davis will be present. 2:00 pm – Solos – The solo electro-acoustic repertoire is the focus of this concert featuring works by Ken Ueno (Talus, 2007) performed by guest violist Wendy Richman; Rand Steiger’s 2013 work Concatenation, featuring guest bassoonist Rebekah Heller; a 2011 clarinet piece written and performed by Matt Ingalls: CrusT; Javier Alvarez’s 2001 Shekere, with SFCMP’s Daniel Kennedy on solo percussion, and Roger Reynolds’s 1985 composition Transfigured Wind for solo flute. Festival Pavilion. 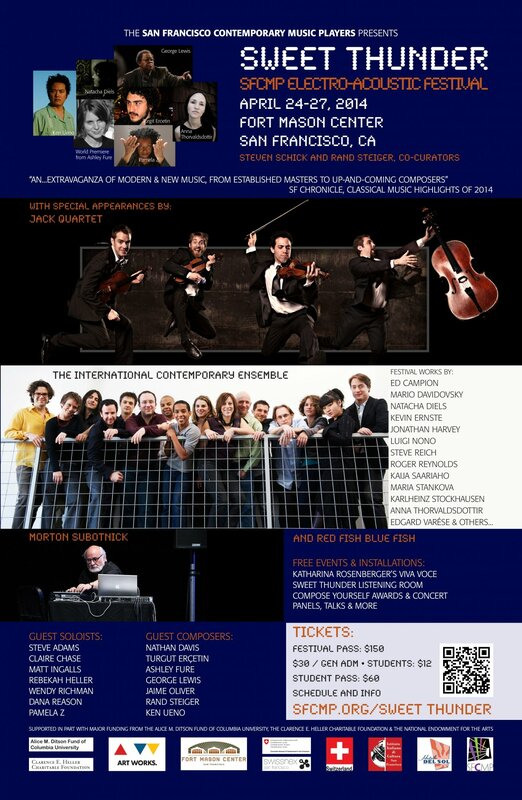 7:30 pm – San Francisco Contemporary Music Players (and Friends) – Saturday April 26. SFCMP is joined by guest performers in a journey through the history of electro-acoustic music, with epic works by Edgard Varèse (Poème Electronique, 1958; and Déserts, from 1954), as well as Mario Davidovsky’s 1992 Synchronisms No.10 for solo guitar performed by David Tanenbaum; Kaija Saariaho’s 1986 work Io, partnered with a new commissioned work from composer Ashley Fure (Albatross), and a special performance by SFCMP Artistic Director Steven Schick with Bay Area favorite Pamela Z in a new work, (v)erstählen. FMC Festival Pavilion. Concert sponsored by the Clarence E. Heller Charitable Foundation. 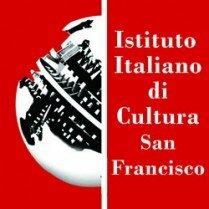 12:30 pm – Compose Yourself – The Awards Concert of SFCMP’s international high school composer competition will celebrate the next generation of composers with a performance of the finalist works by SFCMP ensemble members along with an awards ceremony. FMC Festival Pavilion; free. 2:00 pm – red fish blue fish/George Lewis/Jaime Oliver – Sunday April 27. Sweet Thunder ends with a concert for the ages, with works ranging from Karlheinz Stockhausen’s 1964 Mikrophonie I, to a new composition by Jamie Oliver. Also on the program, Luigi Nono’s rarely performed 1979 work Con Luigi Dallapiccola, and a new iteration of George Lewis’ 1987 Voyager, featuring SFCMP’s Kyle Bruckmann and pianist Dana Reason. FMC Festival Pavilion.